← Happy 2013-2014 ski season! Is there a smooth way to post something out of the blue after a month of radio silence? No? Then perhaps I can offer you a couple of excuses—erm, explanations—for my absence. In addition to all the normal, expected stuff—the holidays and family visits and post-holiday deadlines—there are two big things keeping me swamped and away from the blog. They also happen to be two things that fill my soul to the brim. The first is the OEC (Outdoor Emergency Care, the 120-hour ski-patrol first-aid) course we’re teaching. I first trained to become an instructor in order to improve my own skills, with a side benefit of passing on the knowledge my instructors tirelessly and generously passed on to me. A few years later, all my energy is focused on the goals of others—the 10 students who are counting on us to teach them how to be competent ski patrollers themselves. It is exhausting. It is frustrating. I literally lose sleep thinking through difficult situations we’re experiencing in the class, wondering if I’m doing right by these students. It is more rewarding than I could have possibly imagined. Participants in the inaugural 100K Vertical Challenge in 2012 at Whitetail Resort in Mercersburg, Penn. 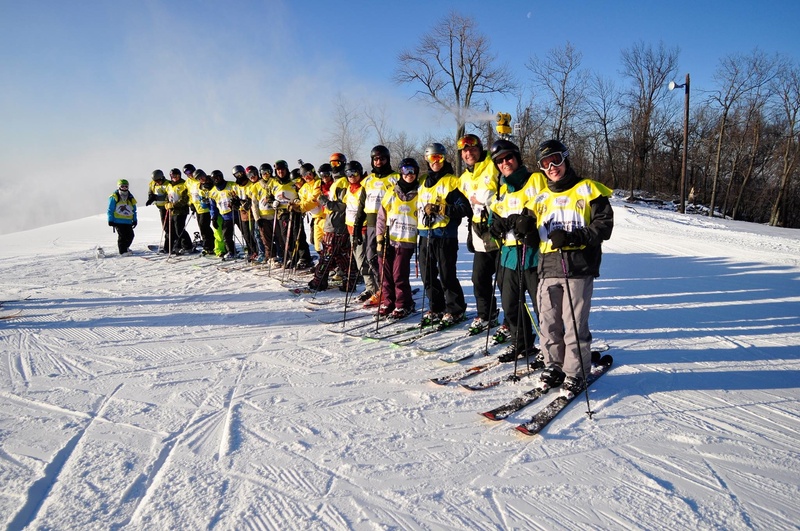 The other thing keeping me busy is the 100K Vertical Challenge, in which skiers and snowboarders attempt to descend 100,000 vertical feet in a single day (107 runs at Whitetail Resort in Mercersburg, Penn.). Steve and I have participated in the event for the past two years (read about my 12-hour adventure in 2012 here for background). As was the case with OEC instruction, I first decided to take part in the event for selfish reasons—it sounded like an incredible challenge, and a great excuse to spend a work day making turns on one of my favorite cruisers in the universe, Snowdancer at Whitetail. Now, in the event’s third year, we are taking a more active role to raise funds for and awareness of Two Top Adaptive Sports Foundation, a nonprofit that provides adaptive ski and snowboard lessons to wounded veterans and other disabled athletes. I’m manning the event’s Twitter feed and Facebook page—give us a follow and a “like” when you get a chance! Stay tuned for a full description of the event (and my plea for help in spreading the word and raising some funds via Team DYD to help Two Top continue its incredible work). For now, happy 2014. I hope your calendars and your souls are as full as mine are.